Through exciting & unique musical events featuring the talents of brass musicians worldwide, CancerBlows raises both awareness and money to encourage research for cancers with a focus on blood cancers & multiple myeloma. CancerBlows was intended as a singular moment-in-time but response has been so overwhelming that we’re continuing the fight with more exciting events including the ones featured below. Our condolences to the families of the following individuals who have chosen to honor their memory by requesting donations to CancerBlows in lieu of flowers. To make a memorial donation by credit card, you may click Donate here and note the memorial in the Memo Section. Nona, Ryan Anthony's step grandmother, has supported him through his battle with multiple myeloma. Jim, a friend of Ryan Anthony's father, was a warrior who fought his own brave battle against multiple myeloma. We send our prayers to the families and wish to express our gratitude for their support. If you can’t find it in the CancerBlows online store, you can find it on Amazon (or you don’t need it!). 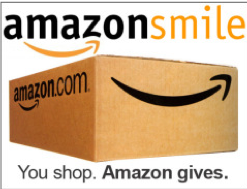 Every time you shop on Amazon through Amazon Smile a portion of your purchase is donated back to The Ryan Anthony Foundation/CancerBlows. We are so excited to announce that the 2017 CancerBlows: The Legends Return CD/DVD Combo Pack is finally available now in our webstore and we believe it has been worth the wait! In addition to highlights from The Legends concert, the DVD has many great Special Features including The Principals Concert; a recap of the MMRF Moving Mountains for Multiple Myeloma Mt. Fuji climb; and video from Ryan Anthony’s acceptance speech for the MMRF’s Courage and Commitment Award. Your continued support of The Ryan Anthony Foundation and CancerBlows helps fund cancer research with a focus on blood cancers like multiple myeloma. Every day we are closer to a cure with exciting new therapies like CAR-T currently in clinical trials. Please donate now to support CancerBlowsand The Ryan Anthony Foundation's mission to use music as a catalyst for hope and healing. Get CancerBlows Merchandise in the Online Store! 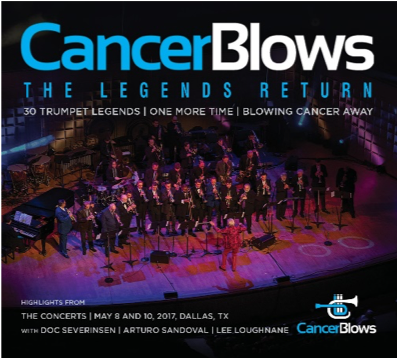 All profits from 2017 CancerBlows: The Legends Return events benefit Baylor Health Care System Foundation and Multiple Myeloma Research Foundation. and also in the rear public parking lot on Wade Street next to One Arts Plaza. The entry gate will be lifted. CancerBlows artists affiliated with chamber music groups such as Canadian Brass, Boston Brass, Rhythm and Brass and more work with collegiate brass quintets. FREE. CancerBlows artists work with preselected high school & collegiate trumpet players with emphasis on jazz. FREE. Public Q&A session with CancerBlows artists. Topics include warm-up techniques, making a living as a freelancer and professionalism in the workplace. FREE. CancerBlows artists work with preselected high school & collegiate trumpet players with a classical emphasis. FREE. Select local high school and college students are invited to watch the first half of the CancerBlows Big Band and Jazz Artist rehearsal. FREE.